For most of us, legacy is a brief and speculative notion. For some, legacy is a page in a history book. However, for a very select few, legacy is something that defines the fabric of society for generations to come. Amongst these towering figures of our culture, Sir Christopher Wren stands as perhaps the most concrete of all. His history is carved in stone on the very streets of London. As one of England’s most prolific architects, Christopher Wren designed some of the most well-known and broadly appreciated buildings in the country. After the Great Fire of London gutted the city in 1666, Wren was tasked with redesigning 52 of the capital’s churches, including his grand masterpiece – St Paul’s Cathedral. To know Christopher Wren’s buildings is to know London. That’s why, this week, we’re taking a closer look at his best-loved works. Tour the city with us and explore the legacy of this visionary designer. As one of the most ancient churches in London, St Bride’s holds a special place in the hearts of Fleet Street locals. Designed by Wren in 1672, it’s survived wars and fires throughout the ages to become one of the most recognizable spires on the London skyline. A visit to St Bride’s is also a great opportunity to check out some more of London’s most beautiful buildings, including the UK Supreme Court and the Tower of London. The sky-blue interior of St Michael’s in Cornhill is stunningly unique and amongst the most memorable small-scale architectural experiences available in the city. There’s something personal about this singular building that is difficult to forget. Begun in 1672, the church is not exclusively a Wren design, with several of the upper tower sections attributed to Nicholas Hawksmoor. The origins of the Greenwich Hospital is closely entwined with the legacy of humanitarianism and care for the needy in Britain. Originally commissioned by Queen Mary II as the Royal Hospital for Seaman in 1692, the building itself was designed by Wren and Hawksmoor free of charge. To experience the Hospital in its full glory, we recommend approaching Greenwich by boat before exploring inside the beautiful chapel and Painted Hall. 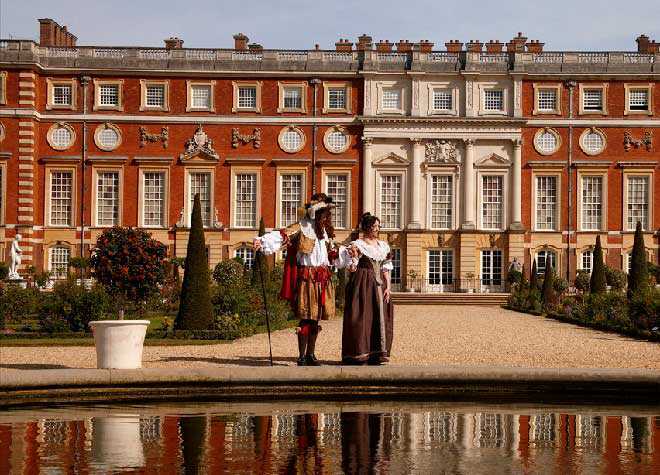 Hampton Court has been a seat of Royal interest for generations. Built as a residence for Cardinal Wolsey in 1528, it was later gifted to King Henry VIII upon the Cardinal’s death in 1530. The King made rapid expansions to the buildings and grounds, expanding on the Cardinal’s original vision for a Rennaissance Cardinal’s symmetrical palace. Over a century later, Wren was commissioned to replace the Tudor palace with a Baroque masterpiece befitting the new Royal line. The result is the stunning red-brick facade known today by visitors around the globe. 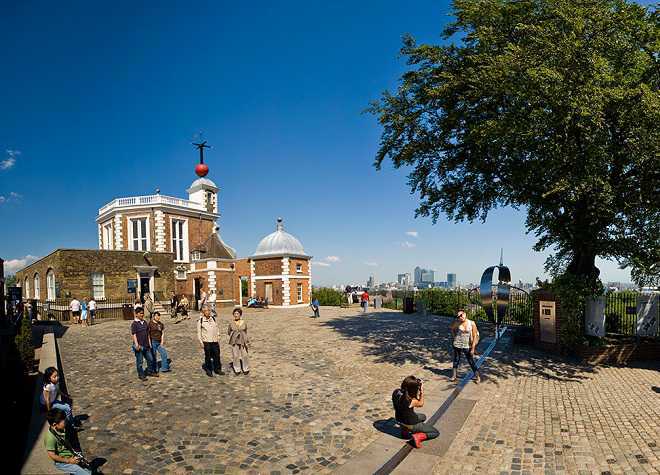 The Observatory at Greenwich is one of Wren’s most beautiful and impactful buildings. As the home of Greenwich Meantime, the observatory is one of the most significant buildings on the planet and, for that reason, arguably the most beautiful on our list. The domes and steeples of the Observatory have welcomed home thousands of sailors from long voyages at sea. St Paul’s is Wren’s iconic masterpiece. It’s the only cathedral of the early modern era to have been completely designed by one chief architect. Wren is said to have redrawn his plans for the Cathedral countless times even as it was being built, continuously evolving the design of its domes and towers. He even took several construction risks that would have horrified architects today. The result, however, is a building that will continue to define the skyline of London as long as the city stands. If you’re fascinated by the Wren buildings in the list above, we highly recommend you take a look through our list of London tours. Explore St Paul’s Cathedral, the Tower of London and Greenwich with narration from our fantastic guides.